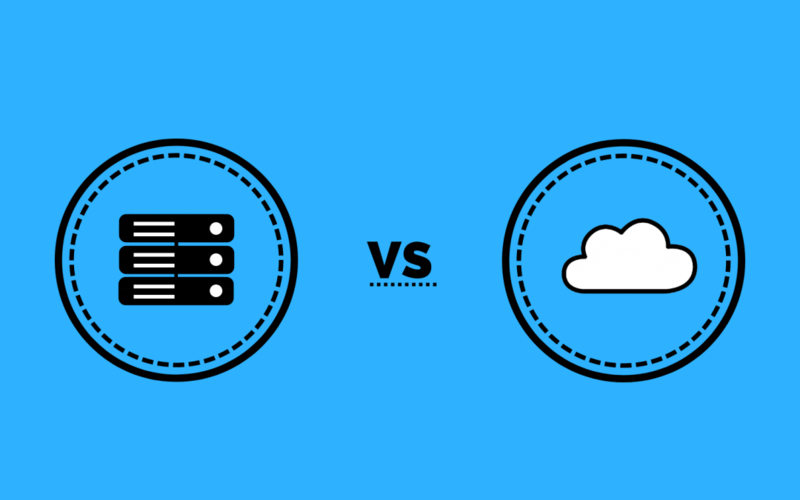 Cloud vs On-premises ERP: Which is better? When implementing an ERP solution, one of your biggest considerations is how you decide to deploy it, whether this is in the cloud or using your own on-premises servers. Both of these methods have their own pros and cons which will have to be considered. There is no one-size-fits-all approach for ERP deployments, when analysing your business’s unique requirements, you will have to determine which method suits you best. There are also alternative deployment options for ERP such as SaaS and hybrid, which we will cover later in this blog post. When looking at where technology is heading, the cloud is becoming more common than traditional on-premises for deploying ERP solutions. This doesn’t mean that using on-premise is obsolete, many ERP’s (including Microsoft Dynamics 365 Business Central) offer the option to be deployed on-premises. This is useful for many businesses, such as those in government or healthcare industry’s which have compliance requirements meaning they must have direct management of their data and hardware—so they have to host their systems on-premises. This blog post will explore some of the main differences between on-premises or cloud deployments for ERP solutions, specifically Microsoft Dynamics 365 Business Central. As well as hybrid and SaaS deployments which are available with Business Central. What are the differences between cloud and on-premises? On-premises—uses your own physical servers & IT infrastructure to install and host the solution locally to your business. Cost is one of the biggest differences between these two models. When using a cloud service, you will typically pay on a monthly or annual basis on requirements which are set by the hosting provider. With Azure hosting, the cost is typically around £40 following a per user/month model. Moving to the cloud was originally very expensive, making it cheaper to purchase and maintain your own servers, but as technology has improved throughout the years and the cloud has become such an integral part of the internet, it has become a lot cheaper to host using the cloud. If you want to host on-premises, on the chance that your business doesn’t already have IT infrastructure in place, you will have to purchase a server to host your systems, as well as the required air conditioning, power and space to keep it in. This hardware can add up and become an expensive initial investment for businesses, and this is before you purchase your ERP solution! With the cloud, you are essentially paying a hosting company to rent these servers from them and have them do everything for you. However, one thing to consider is that after you have been running your system for some years, there will eventually be a break-even point. This is where the initial cost of the on-premises server and running of it will become lower than the continuous monthly costs of hosting in the cloud. A typical break-even point will happen after several years, but there is a high possibility that once you reach the break-even point, your servers will be becoming obsolete and you will require new hardware to keep your systems up to date with technology. This means another big investment will be needed. For businesses, security is a huge concern, they want to know their data is secure. For some businesses, this means they want their data stored on-premises, ensuring they know exactly where it is stored—or for businesses in some specific industries, there is compliance which requires them to store it locally. When your deployment is in the cloud it is still on a server, just located in a data centre somewhere around the world which you can access through internet-connected devices. Many businesses have concerns about the security of cloud systems, especially due to news about data hacking scandals which have occurred recently. However, as cloud technology advances, there are many sophisticated security methods which encrypt your data and use firewalls to ensure maximum security. This doesn’t mean the chance of hacking is completely eliminated, as the same with hosting on-premises, there is still always a chance of it happening, it is just reduced significantly. One thing to consider is that your business is responsible for the security of your on-premises server, but when using the cloud that responsibility is taken away. When it comes to maintenance, everything is done for you when you are using a cloud deployment. You don’t have to worry about your systems as any maintenance to the system is included within your monthly cost to the vendor. When you host your systems locally, the responsibility is in your hands for maintaining the systems. This will mean you have to have someone in your organisation with IT expertise who oversees the server maintenance. More costs may be involved if you have to hire someone with these skills to help maintain your servers. Using the cloud allows you to have access to all the latest technologies and updates straight away, on top of this, the cloud is also very scalable. You pay for the amount of space you require and if you need any more then you can essentially do it at the click of a button for an addition to your monthly cost. With on-premises deployments, you are responsible for updating systems and this can be much more technical and complicated than using a cloud service. The hardware’s capabilities are restricted with on-premises deployments, for example, if you require additional storage or RAM, you would have to go and purchase additional hardware to accommodate this, as well as setting up and then maintaining these systems. This is a much more long and costly process than using the cloud. Another factor to consider as we mentioned earlier is that technology is advancing at a very fast rate, meaning any servers you purchase are likely to become obsolete after use for several years. This will then be another big investment for your business when upgrading to up-to-date technology. These are just a few of the main factors to consider when you are deciding between using an on-premises or cloud deployment for your ERP. This isn’t a comprehensive guide containing every difference, but it should provide a guideline of some of the most prominent differences that need to be considered when your business is choosing its deployment method for an ERP system. What deployment should you choose for Microsoft Dynamics 365 Business Central? Microsoft Dynamics 365 Business Central is an intelligent, modern ERP solution which was originally sold just as a SaaS (Software as a Service) solution. In October, the application was updated and took over the Dynamics NAV product name, subsequently becoming available for on-premises, cloud and hybrid deployments. When you are deciding how to deploy Business Central, you should also take into consideration SaaS and hybrid approaches. SaaS: Software as a Service (SaaS) is a deployment model which operates in the cloud. The difference is that you are basically renting the application which is hosted by a vendor, such as buying SaaS licenses of Business Central from Microsoft. All the costs are included within one price, rather than having separate license and hosting fees. Hybrid: Hybrid deployment is a blend of both on-premises and cloud hosting which is becoming increasingly popular for businesses. It can be seen as a ‘best of both worlds approach’, where you have the flexibility and ease-of-access of the cloud with the security of an on-premises server. However, it does require the same level of infrastructure, maintenance and IT expertise as an on-premises solution. When using Microsoft Dynamics 365 Business Central ‘on-premises’, you can choose to connect to the intelligent edge, which essentially creates a hybrid deployment by replicating your business data in a tenant in the cloud. Connecting to the intelligent edge allows you to access advanced services such as Machine Learning and AI, as well as Microsofts Power Platform, containing applications like Power BI, PowerApps and Flow. There is no right or wrong way to host your ERP solution, it completely depends on your business requirements and what sort of investments you want to make when deploying or upgrading to a new ERP system. We recently updated one of our blog posts for existing Dynamics customers wanting to upgrade to Microsoft Dynamics 365 Business Central, where we explain all of the ways the solution can be deployed and the recent licensing changes to the solution. Even if you aren’t a current Microsoft Dynamics customer, it can help clear up any confusion you might have about the solution if you are looking to implement it. If you have any further questions please feel free to leave a comment below! Alternatively, if you would like any advice or if you are interested in deploying Microsoft Dynamics 365 Business Central, either on-premises or in the cloud, get in touch today, we are happy to help.